For people into the Latin music scene, you mention the band Ozomatli and you can stop there. The group has been packing venues for years, and their most recent visit to Austin in November was no different, well almost. This time around the Grammy Award winning band set up stage in the gym of south Austin’s Travis High school to a crowd of approximately 1000 students. For an hour, the band gave a high energy performance that had students getting up to dance mere feet away from the band. Afterward, I caught up with singer and guitarist Raul Pacheco and bassist Wil-Dog Abers. Ozomatli played the show before their regular show at Stubbs that evening, but stopping at school like this is something the group has been doing for years. Local organization Anthropos Arts reached out to the group and worked with Travis High school administration to get the show together. Anthropos has been working to create partnerships between the live music community and east Austin schools going on 10 years, with the goal to expose students to music they otherwise wouldn’t hear. 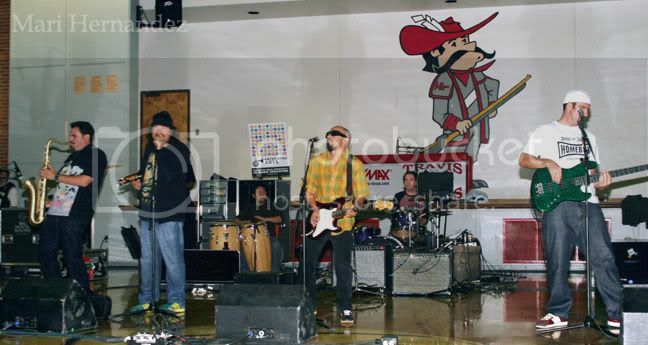 So when Ozomatli came to Travis, it was a school-wide affair. The high school is divided into five academies. Students sitting in the bleachers were visual and performing arts students, or as a reward for grades or attendance. Students in the culinary and hospitality academies were responsible for catering lunch for the band, and student media members covered the event for the school’s print and television projects. Student Juan Najera got to interview the group for the school’s Rebel TV show has always been a Ozomatli fan. The lasting impression of shows such as these leaves more of an impression than their regular gigs. For some students, their fun went beyond watching from the stands but actually playing a song with the band. Raul says he loves doing these types of things to give the students an extra bit of encouragement. Even though some students hadn’t heard of Ozomatli until that day, and some may not have understood the lyrics, you wouldn’t have known it.